This is for children of grades 7-12 only. * provide encouragement and assistance to young beetle enthusiasts (grades 7-12). * promote the study of beetles, the most diverse group of insects, as a rewarding lifelong avocation or career. * provide opportunities for young people to develop important life skills such as leadership, cooperation, communication, planning and conducting a scientific study, grant writing and managing funds. * provide some financial support to enrich activities or projects. A Youth Incentive Award Committee from the Coleopterists Society will evaluate the applications and will select up to two winners annually; one each in junior (grades 7-9) and senior (grades 10-12) categories. The selection committee invites proposals for topics such as field collecting trips to conduct beetle species inventories or diversity studies, attending workshops or visiting entomology or natural history museums for special training and projects on beetles, studying aspects of beetle biology, etc. The proposed activities or projects will be evaluated on their degree of creativity, educational benefit to the applicant, scientific merit, feasibility and budgetary planning. This Award is for proposals by individuals only. Each applicant is strongly encouraged to find an adult advisor (teacher, youth group leader, parent, etc.) to provide guidance in proposal development, but the proposal MUST be written by the applicant. The Coleopterists Society would also be happy to assist in establishing contacts between youth and professional Coleopterists. Applications for this year must be submitted by 1 November 2017. Register now to reserve a spot in this FREE web seminar at http://learningcenter.nsta.org/eclipse to get suggestions for ways to explain eclipses and the science behind them, plus observing techniques that work in small or large group situations. We look forward to interacting with you during the webinar. The Paleontological Research Institution (PRI) has a long history of providing excellent resources and professional development for teachers, and they have just published the Teacher-Friendly Guide™ to Climate Change. This book includes both the basics of climate change science and perspectives on teaching a subject that has become socially and politically polarized. The focus audience is high school Earth science and environmental science teachers, and it is written with an eye toward the kind of information and graphics that a secondary school teacher might need in the classroom. You can download a free pdf of the book or purchase a hard copy here . A brief description and excerpt from the book (first chapter) are in a Geological Society of America blog post here . In addition, PRI has started a crowdfunding campaign to raise money to send the Teacher-Friendly Guide™ to Climate Change to teachers at public high schools across the country. You can join in this campaign or let your friends and family know about it by going to http://bit.ly/TeachClimateScience . Ingrid H. H. Zabel, Ph.D. I hope you are having a great summer break. I have had so much fun meeting so many of you over the past couple of months during professional development events! Please find our KSDE Science Newsletter for June 2017 using the link below. There are a lot of resources linked in this issue including a few for the upcoming solar eclipse. Let me know if there is anything I can do to help you. MANHATTAN, Kan. - JUNE 18, 2017 - The application deadline for the 2018 Kansas Foundation for Agriculture in the Classroom (KFAC) Janet Sims Memorial Teacher of the Year and Kansas Farm Bureau (KFB) Foundation for Agriculture Regional Excellence in Teaching awards is fast approaching. The awards honor Kansas teachers who excel at incorporating agriculture into their everyday classroom curriculum. Applications are due June 30, 2017. All K-12 district-certified Kansas teachers who currently engage in integrating agriculture into a non-vocational agriculture classroom setting are eligible for the award. Applications will be evaluated on creativity and utilization of agricultural information, interdisciplinary approach, advancement of educational standards and student impact. The Teacher of the Year award winner will receive an all-expense paid trip to the National Agriculture in the Classroom (NAITC) convention, sponsored by High Plains Journal and AG am in Kansas. KFB regional award winners will receive their choice of a $600 scholarship to attend the NAITC convention or a $200 cash prize. The 2018 NAITC conference is slated for June 26-29, 2018 in Portland, Maine. The Janet Sims Memorial Teacher of the Year award has been in place since 2008. The award honors the late Janet Sims, an educator for more than 30 years and a strong agriculture advocate. Sims served on the KFAC board of directors from 2005 until her passing in 2007. Applications can be downloaded on the KFAC website at www.ksagclassroom.org by clicking on Teachers and Teacher of the Year. Application deadline is June 30, 2017. The Kansas Foundation for Agriculture in the Classroom (KFAC) is a 501c3 nonprofit organization. KFAC was founded in 1982 as part of a nationwide initiative to help students gain a greater awareness of the role of agriculture in the economy and society so that they may become citizens who support wise agricultural policies. For more information, visit www.ksagclassroom.org or call (785) 320-4350. Last month, the EQuIP Peer Review Panel (PRP) for Science expanded its fall 2016 call for submissions with the goals of (1) expanding the categories of lessons and units that will be shared by the PRP, (2) announcing a new digital badge that will follow high-quality materials wherever they are posted online, and (3) opening the PRP review process to developers who face intellectual property constraints. A new category entitled "Quality Works in Progress" was created. Early reviews by the PRP surfaced numerous lessons and units that addressed various criteria of the EQuIP Rubric for Science very well, but did not rate highly enough to be shared with the public. Therefore, a new category has been added that will include any lessons and units identified to have strongly addressed at least one of the rubric's criteria. A new digital badge for "Examples of High Quality NGSS Design" was developed. In the future, any lessons and units identified by the PRP as "Examples of High Quality NGSS Design" will be both shared online and awarded the new digital badge. With the PRP's approval, the unique badge can be displayed on the submitter's website(s). Achieve added a new submission pathway for developers with intellectual property constraints. Developers who were previously restricted from submitting NGSS lessons or units under one of the Creative Common licenses can now have their materials reviewed and recognized by the PRP. For any materials deemed to be "Examples of High Quality NGSS Design", developers can use the new badge if they agree to (1) share the materials publicly and make them freely available, (2) restrict the claim of high-quality NGSS design to the specific lesson or unit as it was reviewed by the PRP, and (3) post the PRP's feedback along with the reviewed instructional materials. Click here for important details about the current submissions process for lessons and units. The PEEC Tool is Coming Soon! Later this month, Achieve will release the latest version of the PEEC tool. "PEEC" stands for the Primary Evaluation of Essential Criteria for NGSS Instructional Materials Design. Along with recent revisions to the EQuIP Rubric for Science, the resource build on the public draft of PEEC to (1) help educators identify instructional materials programs designed for the NGSS and (2) help curriculum developers and publishers design their materials for the NGSS. Although PEEC was specifically designed to evaluate materials designed for the Next Generation Science Standards, development of the tool was rooted in research from the NRC's A Framework for K-12 Science Education which shows what works well for all students when learning science. Therefore, any state or district that has adopted science standards based on the Framework can benefit from using the PEEC tool. This issue of NGSS Now features an example of how certain PEs* could be bundled in order to develop an instructional unit that engages students in science phenomena. Teachers Note: This month's featured phenomenon led to the discovery of Neptune. You may need to add an experiential element for students to access the phenomenon. For a more in-depth look at these NGSS PEs and to search for others, read this. See where these ideas are introduced in A Framework for K-12 Science Education (pages 116, 175, and 177). In the early 19th century, a group of astronomers were using a telescope to observe Uranus' orbit around the sun. They noticed that the planet's orbit was irregular and not elliptical as they had expected. Why was this the case? Click here for a video of an elliptical orbit. 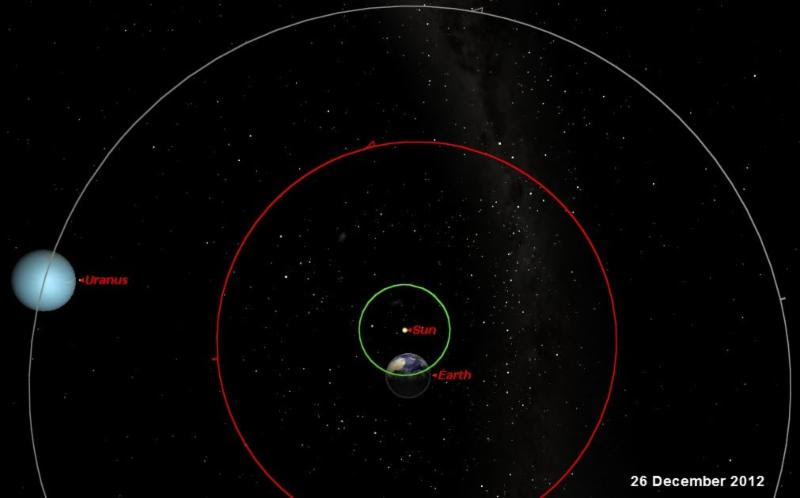 [with simulation of orbit] Observing the irregular nature of the orbit, what things might interact with it to cause it to move slightly off course? Are those things pushing or pulling it? Does this planetary interaction take place elsewhere in the solar system? Galaxies? What other effects does gravity have in the solar system? [after determining the cause of the irregular orbit] Examine data to analyze the size of Uranus and Neptune. How might Uranus' orbit change if Neptune had more mass? Less mass? Middle school teachers in Kings Canyon Unified School District (KCUSD), a CA NGSS K-8 Early Implementation initiative district, have been diligently working on transitioning to the NGSS integrated model for middle school. This year, the teachers focused on building their own knowledge of the Science and Engineering Practices (SEPs). They have been gathering and sharing ideas at monthly collaborative meetings to how to make sure their students are not just learning about science but that they are actually doing science in their classrooms. MS-LS1-3: Use argument supported by evidence for how the body is a system of interacting subsytems composed of groups of cells. Through multiple activities, students explored, researched, collaborated, and communicated information related to specific body systems and how they interacted with each other. Mr. Nikkel wanted students to understand that the different body systems are made up of organs that must all work together for the system to function properly (Crosscutting Concept: Systems and System Models). He found an online simulation from Gizmos called "Digestive System" that allowed students to investigate the order and function of the organs that are involved in the breaking down of food, absorption of nutrients, and elimination of waste. Students used the simulation to test the model digestive systems that they created. Read more. As Capital School District chemistry teacher Corey Pennypacker has implemented the NGSS with his existing curriculum, he's witnessed increased interest and enthusiasm among his Dover High students. "The kids are into it because we're using real-world applications," he said, citing as an example an assignment he gave students to determine how many chemicals should be added to a home pool to reach the correct pH balance. "We propose a scenario and they have to reason their way through it. It's definitely a different way of teaching." Pennypacker was one of hundreds of NextGen teacher leaders, other educators and science education advocates who gathered at the Department of Education in Dover to showcase the valuable NGSS work taking place in Delaware schools. Much of the NextGen teacher leaders' focus over the past year has been on the development of NGSS-aligned performance tasks, which they showcased in a fair-like exhibition at the event. Read more.